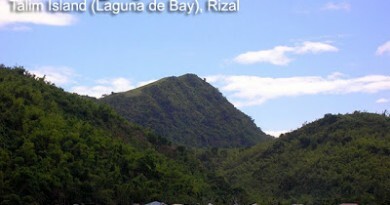 There are three proximate, almost interconnecting mountains in Southern Batangas, straddling the southern coast of Luzon: from east to west, Mt. Daguldol, Mt. Lobo, and Mt. Banoi. Locals actually refer to the entire mountainous area as Lobo, further suggesting the unity of these peaks. Daguldol has been a hikers’ favorite since the early 2000s (see Hiking matters #239). 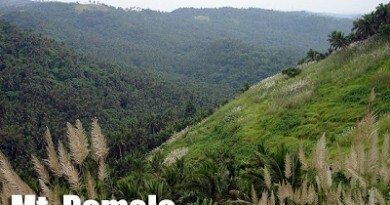 The two others, however, has been left in near-obscurity, probably because of the difficulty in accessing the town of Lobo, which is 35 kilometers away from Batangas via difficult roads. However, the improvements in roads and highways, particularly the integrated SLEX-Star Tollway, has significantly decreased travel time, once again placing Banoi and Lobo within striking range, either as a dayhike or an overnight. In 2011, I climbed Mt. Banoi, reaching its summit via the Old Towers’ Peak (see Hiking matters #153). 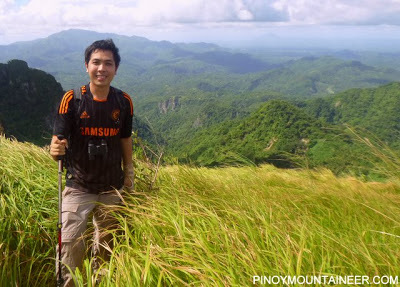 In 2012, I returned to do a hike up Lobo, reaching the Nagpatong (Patong) Peak, 710 MASL. I also asked for the Bangkalan Peak, which I have heard from other hikers. It turns out that there are the main trail forks into two different peaks, both of which are worthy destinations. To further complicate things, there is what people call ‘Gulugod Baboy’ – the very peak of Mt. Lobo, as well as Mt. Naguiling, of old accounts, and finally, a traverse to Mt. Daguldol, so as not to confuse hikers who are interested in Mt. 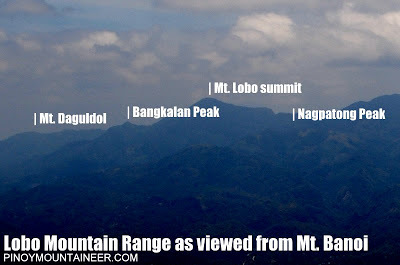 Lobo, this page is an effort to integrate what we know of this exciting mountain range and its several peaks. I was pleasantly surprised by the pristine beauty of Mt. Lobo. 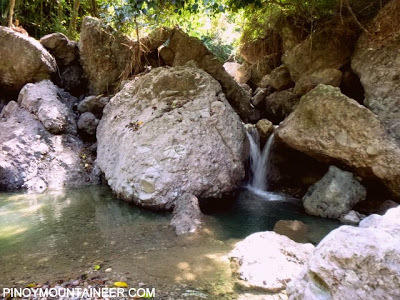 Its trail offers a diversity of environments: clean, pleasant streams, moderately-sloped trails that offer a view of the forest canopy, and peaks and viewpoints with nice views of practically all of Batangas province, the Verde Island passage, as well as many Southern Tagalog mountains. Moreover, the flora and fauna in the mountain are spectacular: you can see many birds from the jumpoff to the summit. On late afternoons and early mornings, you may also hear the monkeys who reside deep in the forests. The trail up Mt. Lobo starts at Curba, Brgy. Na, Lobo, Batangas, although a jeepney or a 4×4 vehicle can drive through the river, go past the elementary school, and reach the true jumpoff, Sitio Kastila. From here, the trail immediately passes through a nice, clear stream. The first highlight of the trail is a small waterfalls called ‘Katiting Falls’, with a nice pool where hikers can bathe after the hike. Past the river, the trail would lead to a sloped woodland which is right beside a gorge. For birders, this is a perfect birding spot as the expanse of the canopy is brought into the fore. Interestingly, electric cables and poles can be found along the trail, for Mt. Lobo, like Mt. Banoi, is a ‘living mountain’ in the sense that there are houses and small communities all the way to within 30 minutes of the peak. Of course, this also means that there are many water sources. The trails to Bangkalan and Nagpatong Peaks diverge in what is known as ‘Dalawang Daan’, in which the leftward trail leads to Bangkalan, and the rightward one goes to Nagpatong. The trails are quite similar either way, but Bangkalan has a wider campsite compared to the infrequently hiked Nagpatong. Atop either peaks, the view is spectacular: a prominent Mt. Maculot (NW), Mt. Malipunyo and Mt. Makiling behind it on its left side (NNE), Mts. Kalisungan and Atimla, and even the Seven Lakes of San Pablo seen as faint bands in the ground (NNE), Mts. Cristobal and Banahaw (NE), and, much more proximally, the higher peaks of Lobo, eclipsing Mt. Daguldol (E). To the south lies the Verde Island passage, with Verde Island itself and behind it, Northern Mindoro. On a clear day, Mt. Malasimbo and even Mt. Halcon can be seen (SSW). Meanwhile, one can appreciate Mt. Banoi as the large mountain west — completing the beautiful spectacle. For hikers who decide to go to Bangkalan Peak, there is the additional challenge of trying to reach Gulugod Baboy, which we are tentatively considering the summit of Mt. Lobo, pending further information on the elevations of its other peaks. From the Bangkalan Peak campsite, this peak is another one hour or so, and can be assaulted with light packs. 0730 ETA jumpoff. Register at brgy hall/military outpost. 1530 Back at Curba. Tidy up. 0800 ETA jumpoff. Register at brgy hall/military outpost. 1100 Back at Curba. Tidy up. *Check with your guide if it is possible to access the summit. Getting there. From Manila, transportation to Mt. 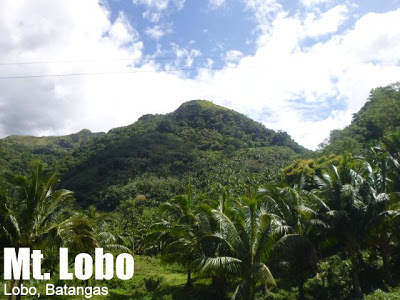 Lobo is a matter of getting to Batangas City by bus (110 kms, 160 pesos, 2 hours), then taking a jeep from Batangas to the town of Lobo (35 kms, 56 pesos, 1 hour, last trip: 1700H). Finally, from Lobo, take a jeep or tricycle to the jumpoff (<5 kms, 30 mins). Guides and registration. Hikers and visitors in Brgy. Nagtaluntong are encourged to register with the barangay officials and the military outpost. Jay Bondoc is the guide for Mt. Lobo, and he guided me personally in November 10, 2012. He may be reached at +639357851477 (his new number of April 2013). As of Nov. 2012, there are no registration fees being collected by the barangay. Getting a guide is not required by the barangay. Camping notes. There are plenty of water sources in Mt. Lobo. There are campsites at the peaks, and it is also possible to camp near the houses along the trail in Sitio Santolan. Cellphone signal is present throughout the trail. Hiking notes. The trail is fairly easy but quite long for a dayhike and the trails are well-established, except in the last 30 minutes (for Nagpatong Peak). Katiting Falls, one of the landmarks of the trail. About to reach Nagpatong Peak. Note the beautiful grassy slopes. According to our guide, it is also possible to do a traverse from Mt. Lobo to Mt. Daguldol. This can be something for hikers to pursue — and Laiya beach is waiting on the other side. There is also another traverse trail that descends to the south, on another beach but within the municipality of Lobo. 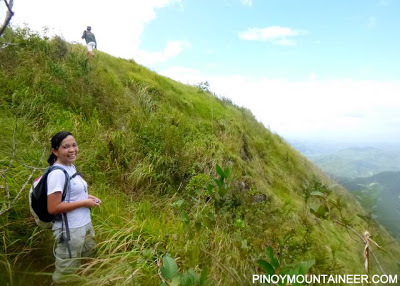 Finally, another peak, called ‘Nagtuktok Peak’, is also a potential destination for hikers. 11 Comments on "Mt. 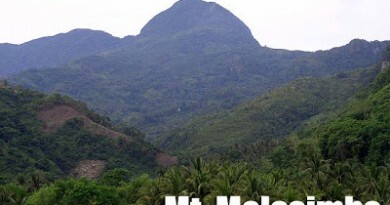 Lobo/Bangkalan Peak and Nagpatong Peak (710+)"
Me planned hike kami itong darating na Feb 21 sa Mt. Lobo. Sinusubukan naming kontakin yung Guide pero sa ngayon di pa nasagot. Yun pa rin ba ang number nya? Meron po ba sa inyo nakakaalam ng number ng Guide? Mga sir.. akyat po kmi jan 15-16.. cno po may kontak no. 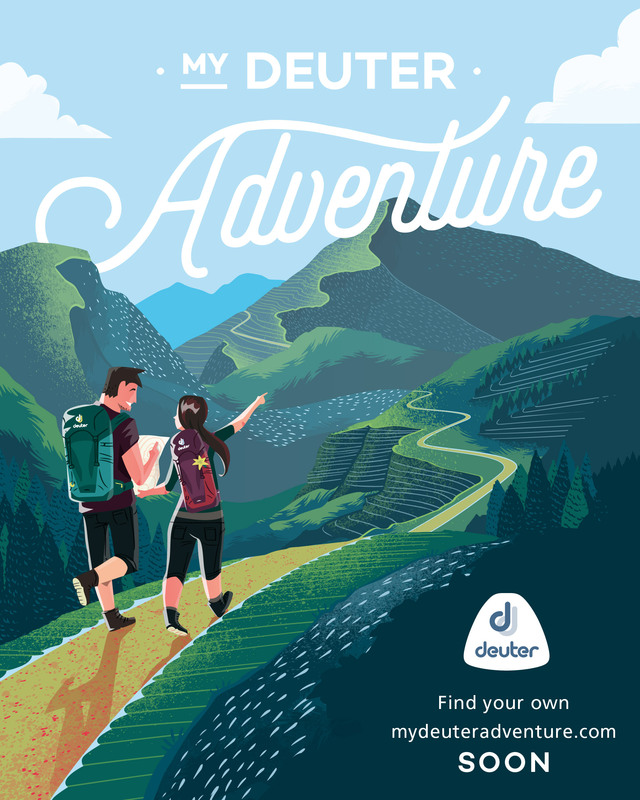 Sa guide po dun? Salamat po… ptxt nlang po 09334075621 magkano n po estimated budget? required na po ba talaga guide dito? trails going to napatong peak were still well established except upon reaching 600~masl whereas the trail becomes confusing because of a fork to a 'kaingin' site is used more than the peak. Upon reaching this fork keep left and look for red ribbons as markers.